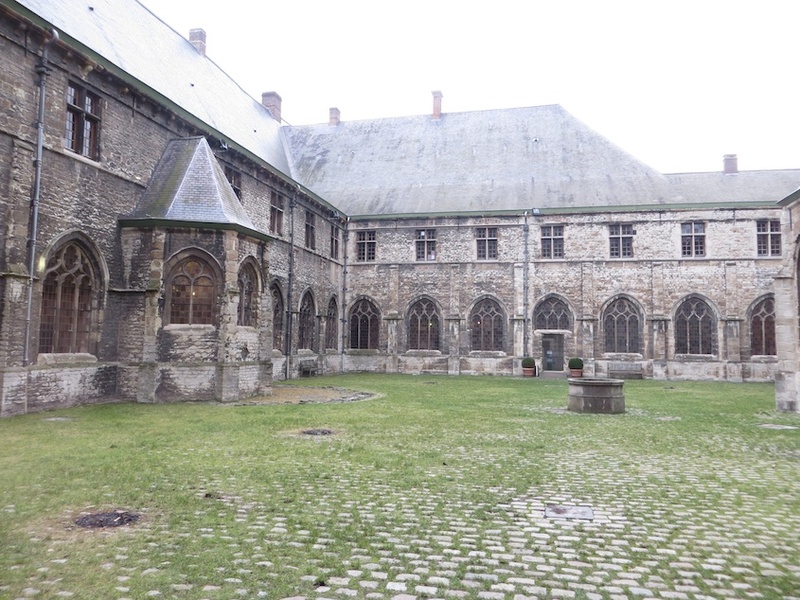 Between Antwerp and Brussels, we make a day trip to Ghent. Why? Our worn out travel guide mentioned a fantastic castle, monastery, and a brewery. Done. 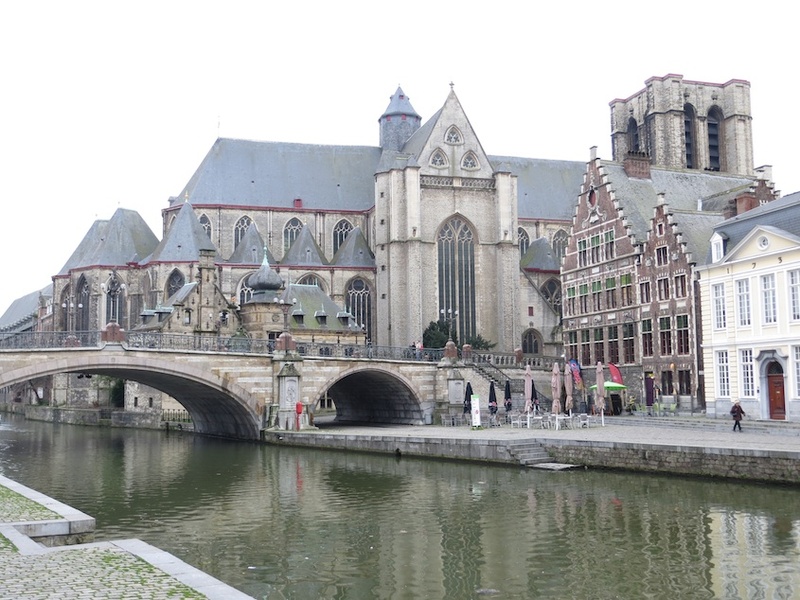 Ghent feels very medieval, sleepy, and just about to sink into its canals. The narrow streets and minute bridges give this town of stone a cosines. 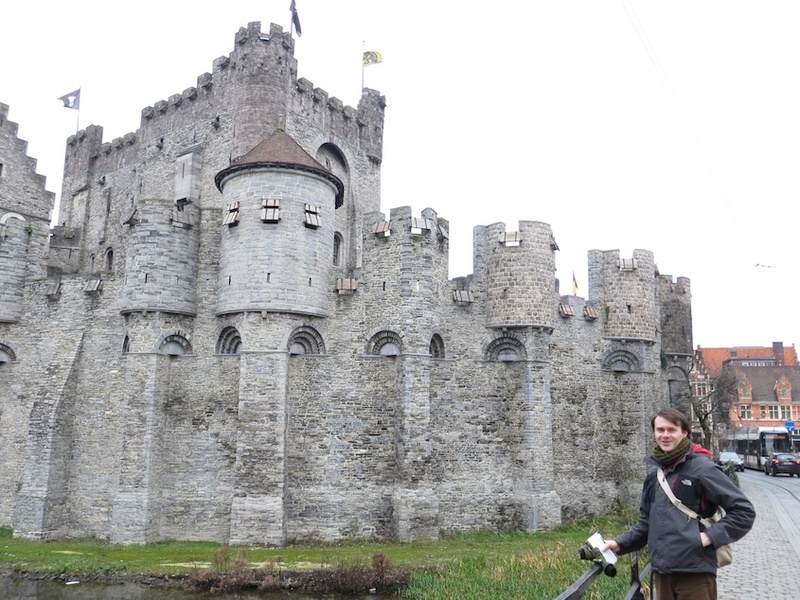 At city center, we find Ghent castle: Gravensteen. Immediately, Monty Python quotes and songs bubble about our heads. In 1180, Philip of Alsace returned from the Second Crusade and, inspired by castles there, modeled this on them. We don the headphones and get completely lost. Spaces make no sense. 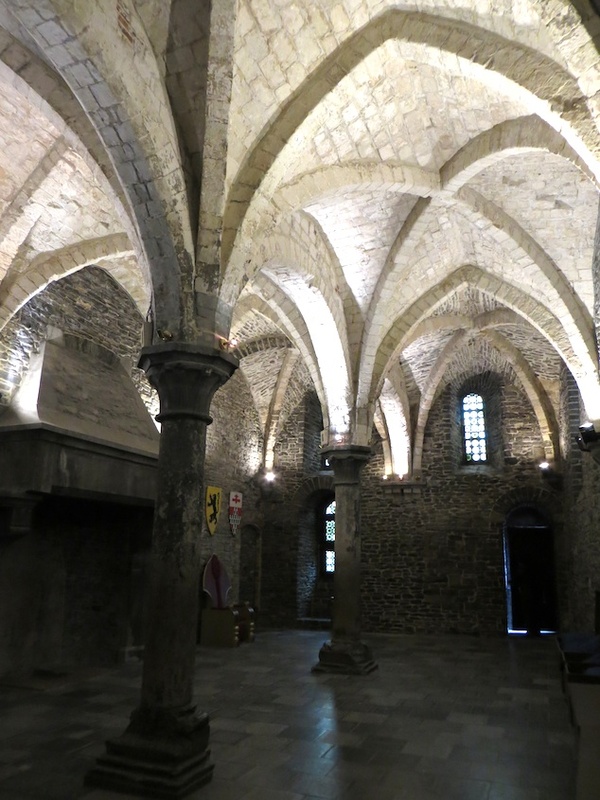 The basements, grounds, and storerooms look expansive, while the chapel and bedroom feel as cramped as the dungeon. The museum is quaint with amour and weapons. The Tower view opens over a cold city, windmills turn lazily and a nuclear power plant bellows steam beyond. After a few hours of imagined dragons, feasts, and jousts, we cross town to Saint Peter’s Benedictine Abbey. 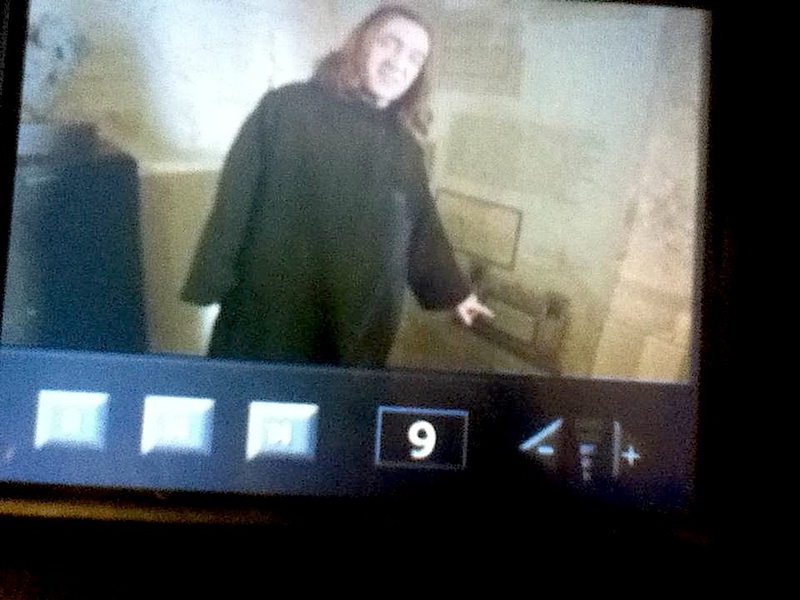 Whereas Gravensteen’s audio guide threw a slew of dates and fairly neutral history at our ears, St Peter’s provides a video guide, but not just any video guide. Here, a monkish accountant named Alison employs us to solve the murder mystery of his slain illicit lover Raphael. 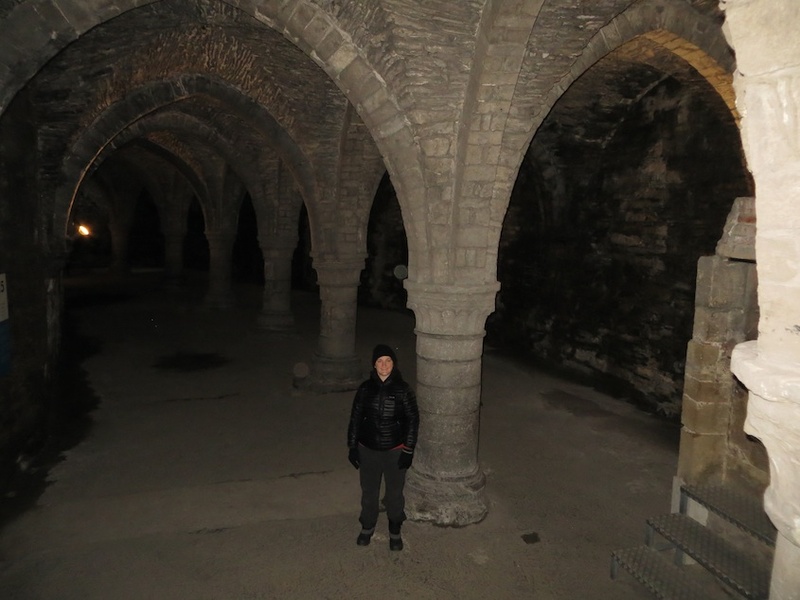 While learning about Alison’s fondness for drink, we explore the Abbey’s long corridors and rooms. It feels eerie, strange, if a bit awkward wandering this place alone in the dead season. But St Peter’s Abbey is charming. 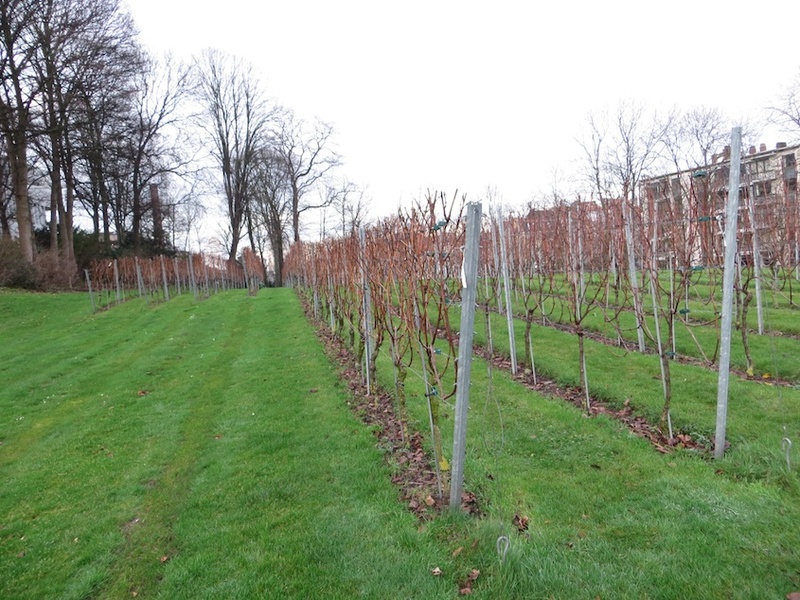 We even stumble on a vineyard: surprising this far in the cold damp North. I assume they’re Reisling, the staff think muscat, Alison just rambles about drinking. 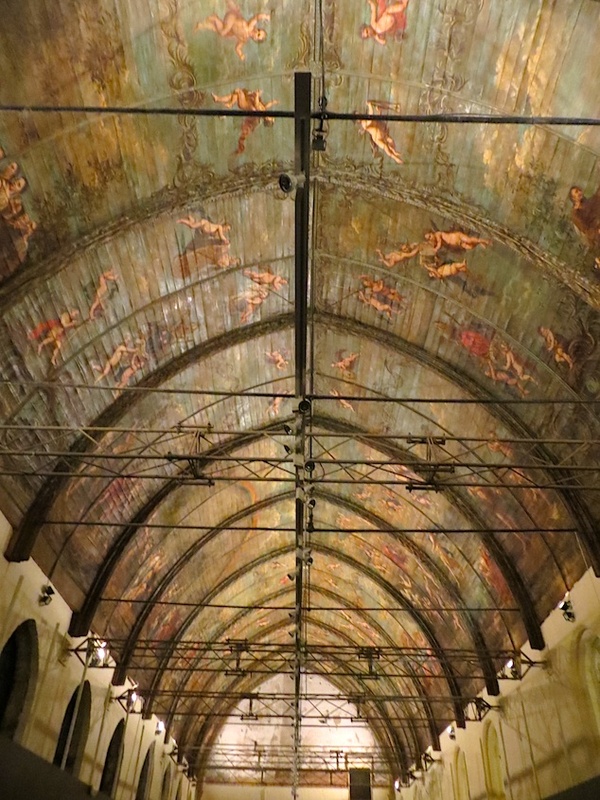 The real show stopper though is St. Peter’s grand dining hall and its painted ceiling. At the end we solve the murder in an attic, send Alison’s spirit away, and to reward ourselves, visit Ghent’s brewery: Gruut. Annick de Splenter is one of a few female brewers in Belgium and the last city brewer in Ghent. She founded Gruut City Brewery in 2009. Her family has made famous beers (Young Pale Ale from Gistel and Dentergems Wit, Liefmans and Lucifer from Dentergem). But what makes Annick different? She never uses hops. Instead of hops, she follows medieval recipes by employing herbs and spices as preservatives and bittering agents (and coursework in biochem). The space jumbles comfy couches against stainless tanks and copper kettles. But how does her hop-less beer taste? APPEARANCE: Hazy, moderate gold amber, with a white head. AROMAS: medium intense pineapple, lemon, and light malt. PALATE: feels dry, twangy, with moderate bitterness, 5.5% alcohol, a medium body, FLAVORS: taste refreshing and fairly intensely fruity with orange peel, dried florals, rolled oats, and barley notes that last a medium plus length. 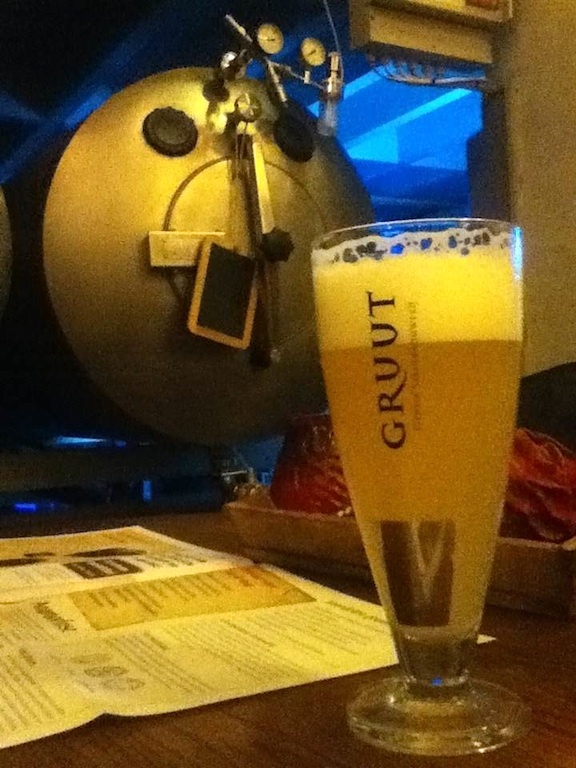 Gruut’s Blond is very good (4 of 5). APPEARANCE: again hazy, a deeper gold color with small fizz, and a huge white head. AROMAS: smell intensely of lemon, lime, salt, and wheat. PALATE: again is bright and tart with lower bitterness, but a clearly warmer alcohol of 8% but a lightish body. FLAVORS: taste fairly intensely of lemon but mostly meringue pie and powdery wheat flour. Again, medium plus length. Gruut’s tripel is very good (4 of 5), really mouthwatering. APPEARANCE: Hazy, light yellow, and a white head. AROMAS: subdued but bright lemon, white flower, and clear cut white asparagus with butter, tomato, burnt sage and dry herbs. Complex. PALATE: dry, tart, soft, 5% alcohol, and lighter than the last two. FLAVORS: med plus flavors of pale grapefruit, lychee, fennel, and heather with a medium. length. Their Wit is very good (4 of 5) snappy, complex, herbaceous, and mouthwatering. The Blond tastes more malty by comparison, like a french fry, or caramel, rounder and tropical. APPEARANCE: looks hazy, medium plus copper amber color, with a cream colored head. AROMAS: proclaim themselves loudly with raspberries, those hard strawberry candies with the juice fill, and caramel. 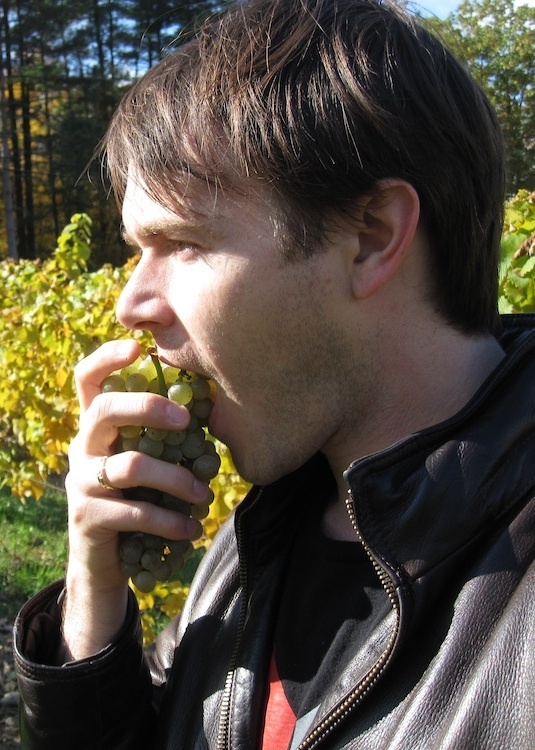 PALATE: feels slightly sweeter, with medium plus acid, medium tannin, high alcohol 8%, and a rich, medium plus body. FLAVORS: taste pronounced with raspberry fields forever, strawberry candies with juicy fill, and a hazelnut finish that seems endless. 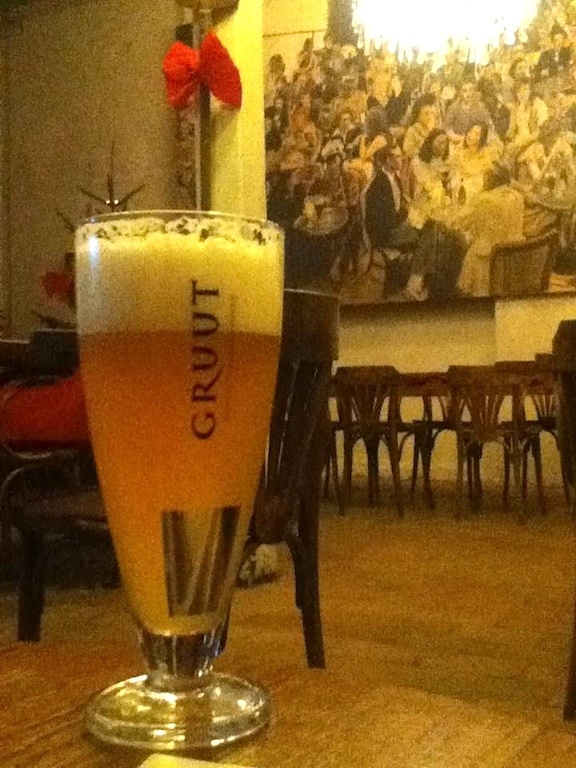 Gruut’s Bruin is outstanding (5 of 5), faultless, complex, intense beer. It is captivating, sultry yet vibrant and silly: like a giggling geisha. I go to the restroom to prep myself for their last beer: Inferno. Gruut Inferno, Ghent, Belgium. €3.50/33cl bottle only APPEARANCE: looks hazy, moderately yellow, with a thin white lace. AROMAS: scream wildly with a blend of Herbs de Provence, bacon, bread yeast, and corn starch. PALATE: feels extra tart, bitter, high in alcohol at 8.5%, and full bodied. FLAVORS: pounce, like chewing on harsh, serious grains, fresh tobacco leaf, yet wrapped up by golden delicious apple flavors that last a long length. Somehow, the alcohol doesn’t conflict, doesn’t sweeten it thanks to all the bittering herbs. But it’s a tough balance between a bitter, tannic, punchy finish and fruitiness. The bacon aroma might be a fault. But we cannot deny Annick’s talent her. Brave stuff. Very good (4 of 5) However, I wouldn’t reorder it because I don’t want another punch to the face. 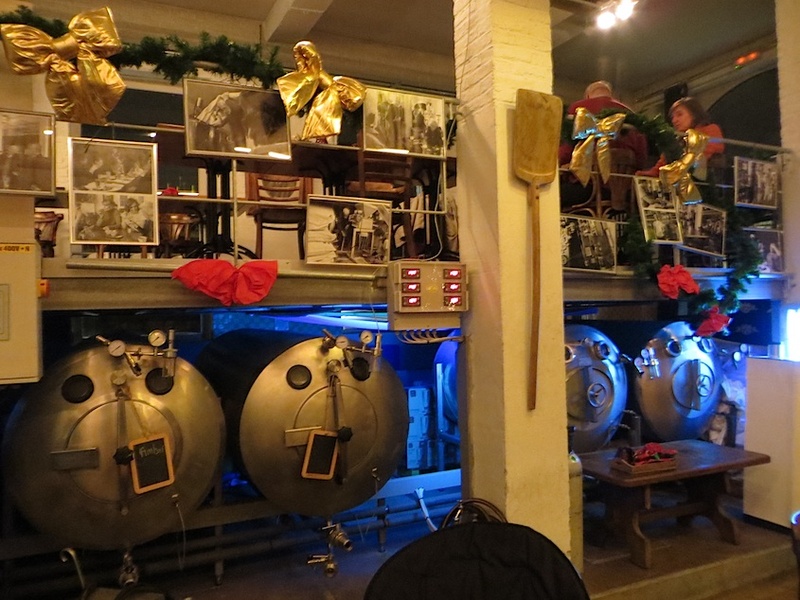 Overall, Annick’s Gruut Brewery is a hip, creative, yet casual local. Love it. Night falls cold, black, and quickly. We catch the last train back to Antwerp. Ghent charmed us completely. As history geeks, we loved this backward looking, medieval, time capsule that somehow embraces enough modernity. 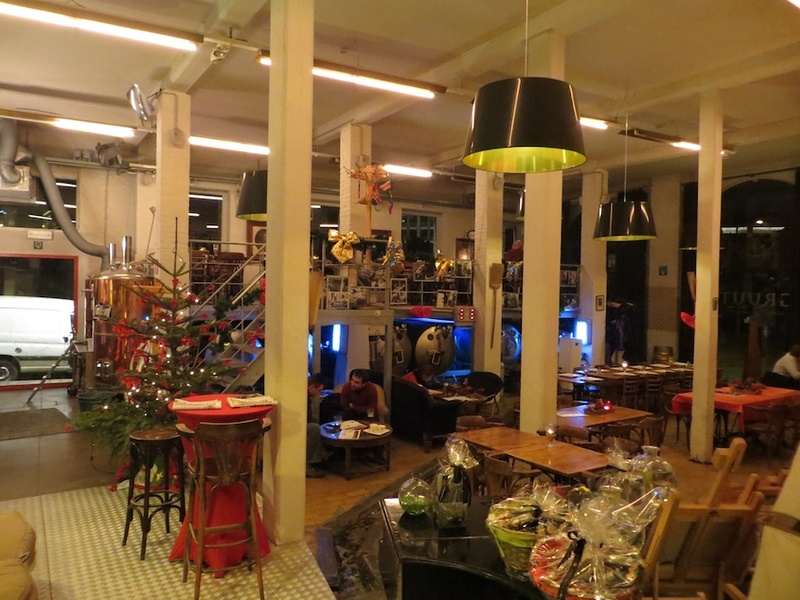 We could live quite comfortably in sleepy, fantastic Ghent. 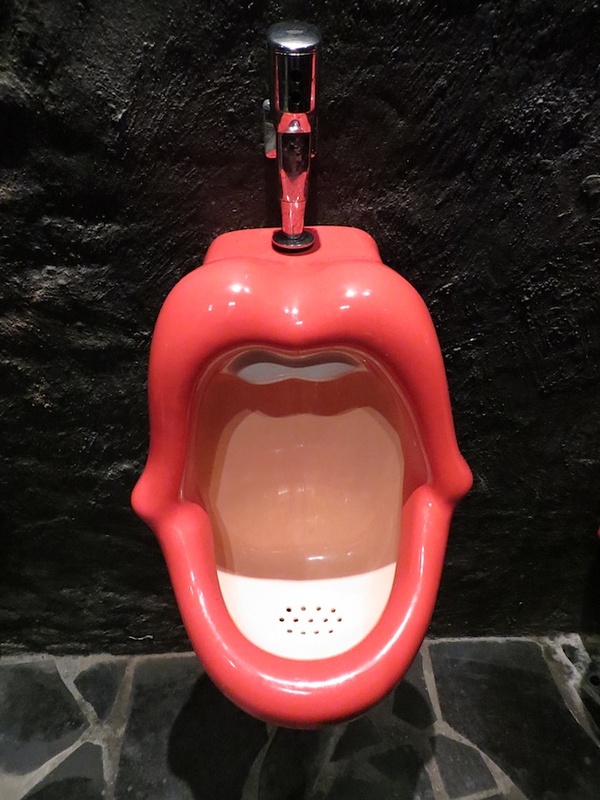 This entry was posted in Uncategorized and tagged Beer, Belgium, Brewery, Europe, ghent, gruut brewery, tourism, travel. Bookmark the permalink.